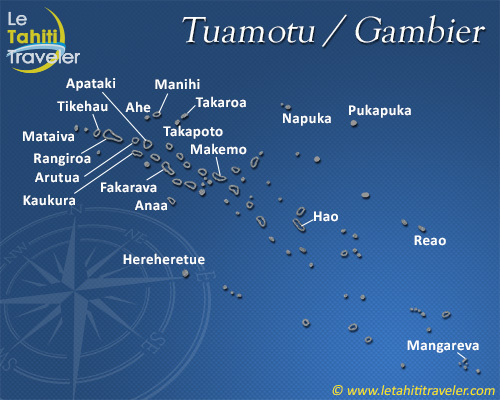 This atoll was the site of the first pearl farm that paved the way for the other Tuamotu islands. Pearl farming has become widespread and perfected to the point where the pearls produced are real jewels worthy of adorning the most beautiful queen. The tourist attractions of this atoll with a deep navigable pass, beside which stands the special village of Turipaoa, basking in the sumptuousness of its lagoon of fairy tale colors and the exceptionally high quality of its flora and fauna and the world renown of its seabed. Manihi and its waters are known to divers for their amazing density of fish at the outstanding spots from the pass to the reef wall and "the circus" inside the lagoon. The usual cavally and napoleons swim past perch, cod, loach and meru while the majestic manta rays dodge past the eagle rays. As a change from diving, visitors can visit one of the many pearl farms or discover the ancient marae sites which are still visible at the north and south ends of the atoll. 1000 CFP francs = 8.38 euros. No banks or ATM's.